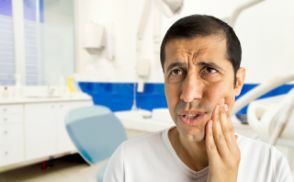 Cavities – When a cavity is large enough, it can destroy the outer layers of a tooth and eventually reach the nerve, where it can cause severe pain. Trauma or fractures – Similarly, blunt force or large fractures can traumatize a tooth and irritate the nerve. Abscess – An infection or abscess is usually the result of a large, untreated cavity. This can be dangerous or even life-threatening if it’s not addressed as soon as possible. Although pain from a toothache is unpleasant, it’s an important indicator that you need emergency care from a dentist in Richardson! After discussing your symptoms and doing a visual exam, a dentist will most likely take an X-ray. This allows them to see what’s happening inside of a tooth and determine whether there’s an infection. A dental filling or crown – These options are often adequate for a mild toothache that hasn’t affected the nerve of the tooth. A root canal – If there is an infection present, a root canal will treat it while saving the remaining tooth structure. Extraction – In some cases, a tooth can’t be saved, possibly due to a severe cavity or fracture. Extractions may also be necessary when advanced gum disease has destroyed the supporting structures around a tooth. When this happens, the tooth can become loose because it doesn’t have the support it needs to keep it in place. It’s a safe bet to say that no one wants a toothache. But with high-quality emergency care, you’ll not only get out of pain but also protect your smile for many years to come! Dr. Adrian De Vincenzo is a general and emergency dentist in Richardson and a graduate of the Boston University Henry M. Goldman School of Dental Medicine. He’s treated every type of dental emergency and always recommends treatment that protects his patients’ short-term and long-term oral health at the same time. If you have any questions about a toothache, he can be reached via his website.